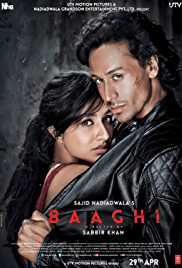 Baaghi is a 2016 Indian martial arts film directed by Sabbir Khan and produced by Sajid Nadiadwala under his banner Nadiadwala Grandson Entertainment. It features Tiger Shroff and Shraddha Kapoor in lead roles, with Sudheer Babu and Sunil Grover in supporting roles. Journalists noted similarities between the film and the 2011 Indonesian film The Raid: Redemption and the 2004 Telugu-language Indian film Varsham.